Just a quick blog to let you know I’ve got a new book out this month! To see the rest of it, buy it or order it from your local library! If you like science you might want to come to see me at this year’s Edinburgh International Book Festival. On the 11th August I’m doing an event called ‘Powerful Forces’ for age 7 – 10 years. It’s all about volcanoes, tsunamis and wind. Get tickets here. It’s out now! I’ve written a new book that’s filled with science questions and answers! You can read more about the process of writing a children’s encyclopedia on my blog here. Really hope you enjoy the book! Do you know about science is published by DK and available in all good book stores. Not the cat, snow! Deep snow everywhere closing roads, schools and putting a stop to world book day celebrations across the UK. My events were cancelled but I’ve been thinking back to World Book Day last year, when something magical happened. *By the way, the teachers dressed up in pajamas or so that’s why I’m in my dressing gown and slippers! Their performance was one of the most beautiful things I’ve seen. I was so impressed by the effort that had gone in to practicing the story and making it so extrodinary. The whole event finished with a capercaillie ceilidh – the children danced around in wheelchairs while I was trying not to cry. Thanks to everyone at Oaklands for making World Book Day a day I’ll never forget! I was invited to Riverside Primary in Stirling to be part of their ‘Enchanted Forest’ storytelling session. 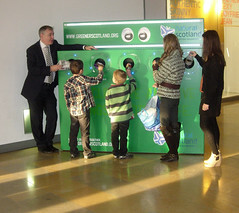 It was funded by the First Minister’s Reading Challenge Inspiring Classrooms Award. We had a wonderful time and it was something totally different to my usual events so I wanted to tell you a bit about it. The teacher, Mrs Gemmell and the children in Primary Four decided they wanted to use their outdoor classroom space for the first time – they wanted a magical outdoor storytelling evening and they wanted to invite their families too. The school bought blankets for the event and everyone wore warms clothes. We’d checked sunset times and worked out we’d start in the light and it would get dark by the end of the session. The children all enjoyed a hot chocolate and then I did some interactive story activities with the group. We met the animals in the forest and learnt more about their behaviour as we re-enacted it. We created the smell of the forest and there was a football challenge with a giant football pine cone. I shared the story of Can’t-Dance-Cameron and everyone joined in on actions. Then it was time to toast marshmallows on the fire. I got to do one too! After that I did a few more activities (including a rocket to make the pop sound of a capercaillie and a camouflage demonstration) and we finished on the story of The Grouse and the Mouse. I know my books off by heart and I realised it would be distracting to turn pages in an outdoor space and much more intimate to share them as a storyteller. This was the first time I’ve told them that way and it worked really well. I used to do a lot of storytelling before I became an author so it felt good to be doing that again. The whole event lasted an hour and there was such a lovely sense of community. The children and parents were brilliant fun and we all shared a love for stories. I signed books and postcards at the end and everyone headed home. I’m glad the First Minister’s reading challenge is encouraging schools to come up with creative ways to enjoy stories – I really loved being part of something so special that night! Thanks to Mrs Gemmell and everyone at Riverside for having me! This year was my first year of chairing at Edinburgh International Book Festival. If you’re an author who’s appeared in the book festival but you’ve been too shy to tick the box that says ‘would you be interested in chairing?’ – well I would very much recommend you consider ticking it. I was shy for three years and I finally discovered this year, I totally love chairing. I much prefer it to doing my own author events but they help. If you’ve been there as an author you’ll know what it’s like to feel really nervous because you’re about to bring a new book to the world and you’ll know how to make it more enjoyable for someone in that position. Also if you work regularly with schools, you’ll know how to interact with an audience so this might be the thing for you! But it’s more than these practical things. It’s about making people feel welcome, valued and important at the festival. It’s about helping them to relax and focus on their event because you’ll take care of extra things like orientation. So here are my top tips for chairing. I’m going to introduce you on stage but I’ll also take you to the venue and take you to the signing tent after and we’ll come back here once everything is finished. So if you’ve got questions, I’ll find out the answer for you or if you need anything I can make sure it happens, I’ll probably send someone else to get it for you because my role is to stay with you the whole time so you’ll always have someone from the book festival with you if you need anything. Tell them what you love about their work and be specific – which book, something you particularly loved. READ THE BOOK THE EVENT IS ABOUT. This may seem really obvious but I was once chaired by someone who told me they hadn’t read the book when they met me – that’s just going to be discouraging and it’s not good enough. Can I make you a tea or a coffee? How are you feeling about the event? Is there anything I can do for you to help during the event? Listen if they start to tell you about something, don’t be all about your agenda and miss being present and responding to the person. They are the most important person there. If you’re dying to ask them about their process or why a plot twists happened in book 5 of a trilogy, maybe wait until after the event. There are chairing notes that get sent to you from the Edinburgh International Book Festival so read them and don’t miss anything. I made a wee check list on a postcard and at some point I said something like “there’s a few things I need to check with you” and I got my list out. I’d already covered most of it but I did things like check the facts I’d researched about them and explained I’d use them as part of their intro on stage. You need to ask if they would like you to field questions and answers at the end of the event or if they would prefer to do it themselves. Nick Arnold once broke his arm during a Horrible Science author event like this one…. and after the event he signed 75 books and then was rushed to hospital in an ambulance. So boys and girls, whatever happens today… you’ll get your books signed! Tony used to get told off for doodling in school but now he gets paid to do it and he’s famous for it so if there’s something you love doing now, you never know, even if your teachers tell you off for it… it could end up being your job in the future! When I was chairing Tim Warnes it was for a younger audience so I wanted to say less and be more visual. I still shared a fact (that Tim and his wife have illustrated over 200 books between them – wow amazing!) but then I used something from the story. In Tim’s books ‘Dangerous!’ and ‘Warning! This Book May Contain Rabbits’ there is a character called mole who loves labeling things. So I made some giant labels with what I thought about the books. There was ‘Brilliant!’ and ‘Fun’ and I stuck them up and held up the books and said what a treat we were all in for and finally I said we had one label left, it was ‘Tim Warnes’, but where was he? And that’s how we brought him up onto the stage. Before and after each event I told the children that they could get a signed copy of the book at Edinburgh International Book Festival after the event. I held up the books and talked about how great they were. With the schools event I told the children at the end of the event that they all had £3 vouchers so they could get £3 off the book and I explained that even if they couldn’t get the book today, they could come back with their Mum or Dad or Grandad or Grandma or Aunties and Uncles and use their voucher to get this brilliant book because it would still be in the shop! If you don’t explain this the children will go into the brilliant shop with a voucher and millions of books to choose from and they might choose one they’ve not read or one that’s for older children or one that’s got a game with it. But if they get a book signed by the author they’ve just seen they’ll remember that forever! So it’s okay to make a big deal about the fact that there’s a chance to meet the author and buy a book and get it signed. That’s what book festivals are all about. I did this at both events and everyone bought lots of books and the publicists were very pleased and thanked me for it! You being genuinely you will put them at ease. It’s a chance for you to meet an awesome creative human being. So that’s my top tips for chairing. If you’re a seasoned chair I’d love to hear you tips too! And if you haven’t chaired before, I hope this will encourage you to do it! Happy World Book Day! All over the world children went to school dressed as their favourite book characters and people celebrated reading through events! Earlier this week I was at the lovely Aye Write‘s Wee Write festival in Glasgow. Again they were so welcoming and friendly. After the events I was interviewed by BBC learning. They asked what my favourite book was when I was a child. The video was published today, in time for World Book Day, you can find it online here. And, if you like your creatures resolutely Scottish, there is always The Grouse And The Mouse, by Emily Dodd & Kirsteen Harris-Jones (Picture Kelpies, £5.99) which follows Bagpipe the puffed up and pompous grouse and Squeaker the wood mouse, as they find out just who really is the most magnificent animal in Scotland. 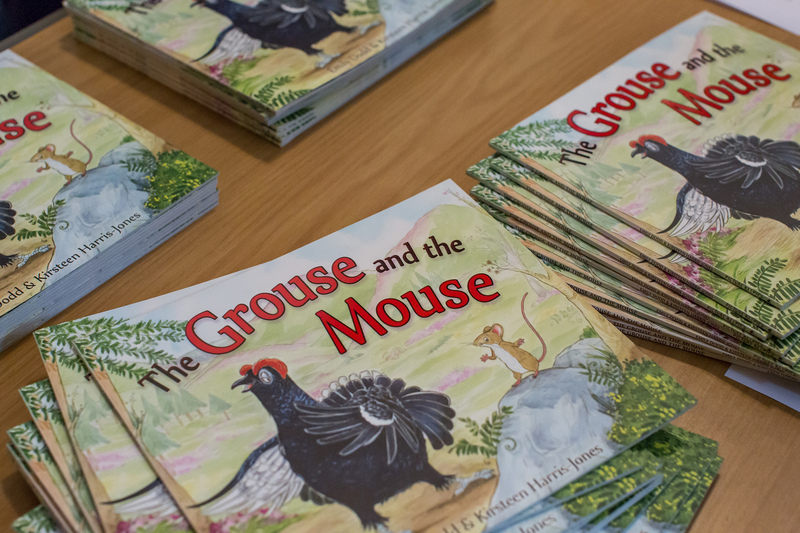 Youngsters will enjoy reading, or having read to them, the story of The Grouse and the Mouse. Emily Dodd’s last title ‘Can’t Dance Cameron’ proved very popular and the tale of Bagpipe the Black Grouse is destined to be equally well received. There are starring roles for Red Squirrels, the Scottish scenery and a Highland cow in a book that is illustrated by Kirsteen Harris-Jones. My 2.5 year old daughter has fallen deeply in love with The Grouse and the Mouse – she has never got through the bathtime routine at the lightening speed she is now, knowing that she will have it read to her (usually repeatedly). So thank you Emily, please write another book of enchanting Scottish creatures soon! You can read and listen to the first reviews that came in for the Grouse and the Mouse here. If you enjoyed reading it, I would totally love it if you reviewed it on Amazon!